In December of 2015, The Key Armory introduced their first set of key designs through a Kickstarter campaign. Inspired by weaponry from various fandoms including Lord of the Rings, Star Wars, various video games, and animes, the first keys that were announced for the campaign were: the Hero’s Sword, King’s Blade, Kingdom Key, Star Saber, and Halfling’s Blade. Needing to raise $10,000 for their goal, there were also hopes for additional designs to be added as Stretch Goals. I joined in on the campaign in the fairly early stages and was thrilled to learn that the stretch goal key designs were actually going to be decided by the backers ourselves! The Eye of Thundara key that I purchased as a birthday present for a friend from The Key Armory. At the end of the campaign, the number of keys being offered had been doubled! We, the backers, had voted in another five designs: the Runeblade of Ner’zhul, Eye of Thundara, Gunblade Revolver, Royal Shield (not a sword, I know, and I was a bit skeptical of it at first until I saw the finished product), and the Blade of the Direwolf. As much as I had liked the original keys, I was really excited about the Runeblade of Ner’zhul as I am a rather large fan of World of Warcraft and immediately knew what key I had to have for myself! The timing for the suspected delivery for these also happened to be perfect for a birthday gift for a geek friend of mine so I also picked up a second key, the Eye of Thundara, as a surprise. Not only was he a fan of Thundercats, but it is a bit of an inside joke between us as well. My house key! The Runeblade of Ner’zhul! I really wish I had a camera that could do these keys justice as the detail work on them is gorgeous! I will admit, I had a few concerns about how the final product would look by the time I received it. My biggest concern was over how the details would look etched into the keys versus the cut out sections. Would the etched details be deep enough to show up? Would the different depths of the details still be visible enough from a distance to see what the sword looks like or would you have to use your imagination a bit more? I was also concerned about the actual size of the key. Obviously, these keys would be a bit bigger than your average house key, but just how big is “a bit bigger”? Would they be so gigantic that I would have to change how I keep my keys in my pocket? Should I just be considering using these as a display or novelty item instead of as a functional key to my home due to their potential size? I needn’t have worried, however! Upon their arrival, these keys have proven themselves to be sturdy, stunningly detailed with good craftsmanship, easy to get cut, a perfect fit on my keyrings (though I have enough keys to keep track of now that I no longer keep my keys in my pocket as much), and they have made some great conversation pieces! The customer service at The Key Armory has proven to be top notch as I had several interactions with them after the campaign ended and I am looking forward to working with them again as they have launched their new Kickstarter campaign. 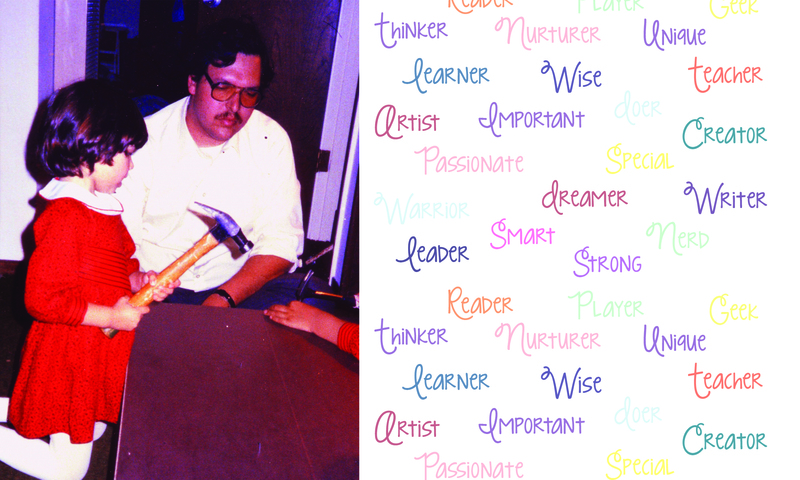 This time they are not just introducing five more designs (the Soldier’s Sword, Sword of Foresight, Power Sword, Defender of the Universe, and Blade of Alfheim), but are also hoping to expand their offerings of keyway types to include Yale keys in addition to the Kwikset and Schlage keys that were offered in the last campaign. Personally, I’m thrilled as it means I can now pick up a few more keys as gifts for my friends overseas! As with their last campaign, there are more designs waiting to be added to the list of offerings and I can hardly wait to see what we add! I can not recommend these keys enough. They’re fun, good quality, span numerous fandoms so that many of my geeky interests are met, the people at The Key Armory are just wonderful people to work with, and these keys are just amazingly detailed! I can honestly attest that everyone who has seen my house key has asked me either where I got it or if I will get them one too! Though a bit on the pricey side for key blanks (they go for $12 retail or $10 as part of the Kickstarter campaign), I still feel they’re worth picking up and, should you not want to use them for your home, they are something fun to simply collect and display. I love decorating for holidays, and I love making things for said decorating. The problem with holiday crafting is that, if you aren’t careful, it can get pretty expensive. This wreath isn’t like that. I spent less than $10 on this wreath, but your cost may vary a little bit because I happened to have a handful of unused rubber snakes on hand thanks to my children. 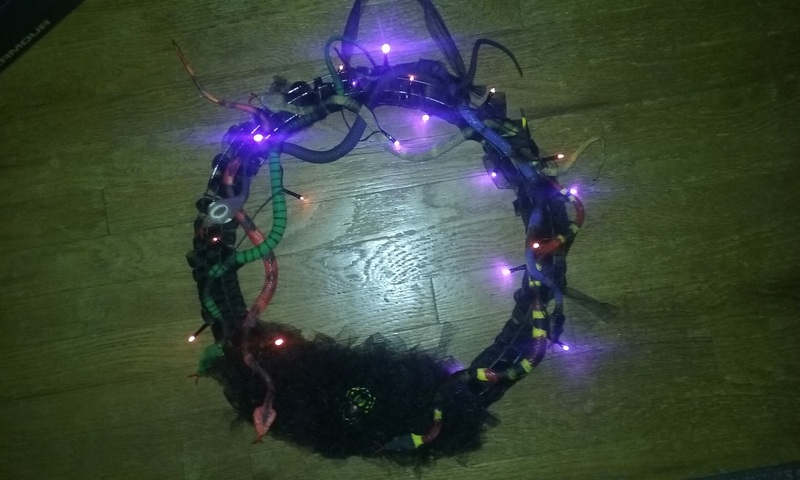 Wreath Form – I chose wire, but you can use other forms just as easily, though I’d recommend spray painting grapevine wreath forms black before you begin. My experience with plastic snakes is that they are generally comically fluorescent. 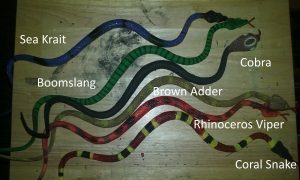 You can leave them the color they come, spray paint them black, or go the more time-consuming route and attempt to paint them in the style of various venomous snakes. The Cobra did not require painting and the Rhinoceros viper ended up much too pink. 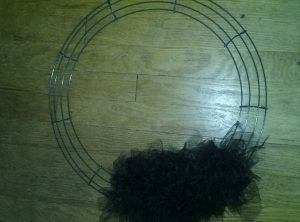 For the bottom fluff, I cut 2-inch strips (maybe 200) and tied each one to the rings of the wreath form. This is the most time-consuming portion of this craft. 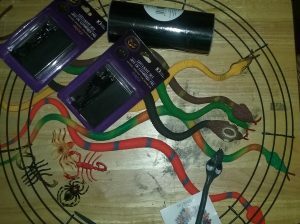 I used strips of Tulle to attach the snakes where I wanted them. I tried it with wire but the wire showed too easily. The only wire I used was for the spider in the fluffy Tulle. I used Tulle to attach the battery boxes to the back of the wreath and wound the lights around the form, tying with Tulle when necessary. Using most of the rest of the Tulle, I wove it through the wreath form, the snakes, and the lights. The more tension you use here, the tighter the weave and the more Tulle you will need. Alternatively, you could also do this with black ribbon. I used a six-inch length of Tulle tied to the top to hang the wreath. I keep this as an indoor decoration as the lights are not rated for outdoor use and I don’t really see my front door that much and want to enjoy it so it hangs in my kitchen where I can enjoy it for the whole of Halloween.